This weeks #WorkoutWednesday is the first of a two part series. My thanks to Neil Lord (again) for the challenge this week. I appreciate our "can Tableau do this?" chats! This week, for the first part of this viz, you'll have to create a highlight table that is sortable in every which way. The inspiration from this came for a requirement from a customer that Neil is currently working with. You might not consider it an amazing viz, but it's something similar to what I've been asked for previously in the field. Hopefully it will also boggle your mind for a bit and get you really thinking. The columns should be sorted by the ship mode selected in the drop down first, followed by the remaining ship modes. The remaining ship modes are also sorted descending by their overall profit ratio. For example if you select Same Day in the drop down, Same Day should appear as the left most column, followed by Standard Class (13.1% profit ratio overall), Second Class (12.0% profit ratio overall) and First Class (11.3% profit ratio overall). 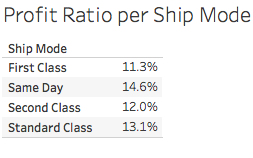 I've put an image below of the Ship Modes profit ratios so you can check. 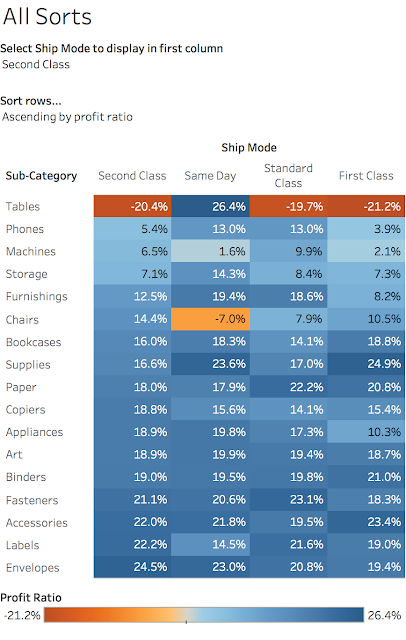 The rows - product subcategories - should be sorted ascending or descending (depending on end user selection) of the profit ratios for the selected ship mode. The data is EU Superstore.